I am thrilled to welcome Elaine Viets here today. I am a big fan of both of her series! Mystery shopper Josie Marcus is finally getting married. But she won’t have an easy time before she walks down the aisle. Lenore, her future mother-in-law, flies into St. Louis from Boca by private jet. Josie thinks Ted’s meddling mother should come in on a broom. Josie loves Ted and wants to avoid an argument, but her patience is sorely tried. Lenore “helps” – read that as “tries to control” – their simple wedding until Josie wishes someone would lock up Lenore. She gets her wish, all right. Lenore is arrested for murder. Dr. Ted has a woman stalker, and she winds up shot. Lenore is arrested for murder one. Now Josie can’t marry Ted unless she finds the real killer. 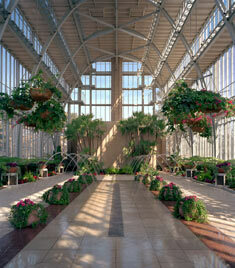 Ted and Josie do get married in the flower-filled Jewel Box in St. Louis, an art deco conservatory beloved by generations of brides. She has a traditional wedding cake with swags of white butter cream frosting. Josie figured their wedding cake would cost about $400, but she hadn’t figured in a $50 delivery fee. She has to mystery shop wedding cakes and flowers to pay for the unexpected extra cost. A wedding cake can cost a week’s salary or more. Way more, up into the hefty four figures. But some couples have their cake and eat it, too: They rent fake cakes for the wedding. Those impressive cakes on display at the receptions are layers of iced Styrofoam. Some fake cakes have a top layer of real cake for the bride and groom to stage the cake cutting ceremony. 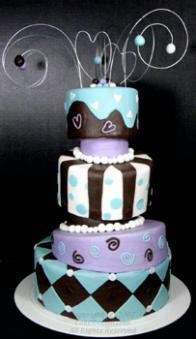 Other fake cakes have a secret compartment to hide a slice of real cake for the cutting photos. Once the cake cutting is over, the fake cake is hustled away and the wedding guests are served slices of cheaper sheet cake. Fake cakes can save couples real money, especially at big weddings. They just have to slice into the right layer for the cake cutting photos. For couples who consider a traditional wedding cake a big, fat waste of money, a fake cake rental starts at about $125, plus shipping. Hollywood celebrities. Corporations celebrating major milestones, including the Ford Motor Company. 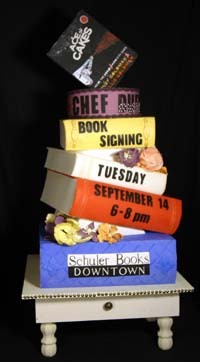 Even celebrity chef Duff Goldman had a fake cake for his book signings. The TV show, “Whose Wedding Is it Anyway?” rented a fake cake. And so do couples who want a sweet show on their wedding day. After the wedding, the fake cake is shipped back to the rental company. Make sure drunken Uncle Ray doesn’t try to snitch a slice of the fake cake. Mystery Shopper Josie Marcus is thrilled to be getting married to Dr.Ted. Her boss gives her an early wedding present/assignment. Josie gets to investigate wedding cakes and flowers. She is also busy finalizing her own wedding plans as her future mother-in-law starts to drive her a little crazy with her “minor” changes. Still it is good to have “pistol packing” Lenore around when she comes to the rescue when a homicidal bridezilla named Molly threatens to kill Ted unless he agrees to marry her. Josie thinks the pre-wedding drama is behind her and there will be smooth sailing ahead. Then Molly is found dead and the pistol packing mama is the prime suspect. Lenore is behind bars and the wedding is on hold. Josie has no choice but to track down the bridezilla killer so that her and Dr. Ted can get married and start their wonderful life together. Josie Marcus is an amateur sleuth everyone will love. In this 8th installment to the Mystery Shopper Mysteries she pulls out all the stops. Planning a wedding, dealing with a bridezilla while not becoming one herself, and catching a killer. Then there’s her future mother-in-law and her helpful suggestions. While she was behind bars Josie felt obligated to accept every one, but she needs to keep her wedding from becoming an over the top extravaganza. This story will have you laughing out loud, following the clues, and wishing and hoping Josie’s dream wedding comes true. This is a fast paced mystery that will keep you guessing until the final clue is uncovered. The author also includes great tips if you are planning a wedding too whether you are the bride or even the future mother-in-law. Elaine Viets always gives us mysteries that are fun and entertaining! Keep them coming Elaine. Leave a comment for Elaine for 5 Bonus Entries ! Thanks, Deanna. The Dead-End Job series is set in Fort Lauderdale. Josie’s series is set in my home town of St. Louis. Josie has an eleven-year-old daughter. Hope you’ll enjoy all 8 books. I like Josie, too. She’s not perfect, but she tries to be a good mother. Now that she’s married, that will add a whole new dimension to her life. I have never read your books but the excerpt makes me want to. Oh, good. I always like it when I discover a new mystery series. Hope you’ll feel that way with Josie. I too love both of Elaine’s series. I know they will always be a good read. 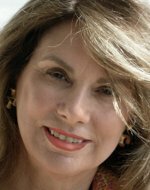 Elaine – have you actually worked as a mystery shopper? It is, Sherry. It’s a good book to enjoy with a cup of tea — and a slice of real cake. Banana bread is my personal favorite. We were lucky with the wedding cake issue. My daughter’s then fiance had a very close friend who was a graduate of the C.I.A. and was a professional baker. He made her cake as a gift and also did the other two kids when they got married. Uri (the baker) is now considered a member of our family. He and his wife and kids are at all the family gatherings. I would love to be the lucky winner of Murder is a Piece of Cake. I forgot that CIA also means Culinary Institute of America. I love men who cook. Hi, Bev. Never worked as a mystery shopper, but my mother did back in the 60s, so I grew up with the business. The mystery shopper questionnaires haven’t changed in more than half a century. Heather, I think you and Josie will be the perfect match. I was lucky with the wedding cake. My beloved Aunt Pauline baked wonderful wedding cakes to help support her family of 6 kids. Her husband had died in the 60’s. The cake was beautiful and delicious. I love the books in both of Elaine’s series. If you haven’t read them, try then now. Wedding cakes made with love are the very best, Pauline. You were lucky. The best wedding cakes are made with love, Jody. You were lucky. This is a mystery with a touch of romance, Heather. Hope you’ll enjoy it. Best wishes. This book sounds great and unique. You all make me feel so welcome here today. Thanks for stopping by. Wedding books are always fun to write, Sharon. I enjoyed being Josie’s wedding planner. That’s interesting how people use these fake cakes. lol. I love both of your series & I’m excited to read this new one & Josie’s wedding episode!! Thanks, Barbara. I loved being Josie’s “mother of the bride” and wedding planner. Me, too. I finally broke down and bought a chocolate cake with butter cream icing and sugar roses. Yum! I had no idea that folks used fake wedding cakes these days! I love this series and have read all the previous books – can’t wait to read this one. You should see the cake toppers, Penny. You won’t believe them. Some are pretty racy. I am diehard Diane Viets fan! I was a mystery shopper for years before my twins were born. I am trying to start doing it again. I really like this series! Hi, Mom2. My mother was a mystery shopper. She said it was a good job when she had kids because of the flexible hours. Glad you liked the series. Oh goody! A new series I haven’t read yet! Love both series! I’ve met you here in Maryland at the Howard County Library. Hope you can come back soon! I remember that event, Susan. It was organized by Jacquelynn Morris and Kris Neri and other mystery writers were there — along with an audience of real readers. Mystery shopping, at least when Mom did it, was exhausting work. But she enjoyed mystery-shopping with her best friend, sort of like Josie and Alyce in my books. I had not idea there was such a thing as fake cakes—but what a great idea! I’d love to read this book. And I’d love to have you read it. Please do and let me know what you think. I’m starting the next Josie book after Thanksgiving. Speaking of which — have a happy holiday everyone. Hope you get to spend it with people you love. Elaine, you are a new author for me! I loved the excerpt-I can’t wait to read this. Thanks for a chance to win 🙂 Happy Thanksgiving! Happy Thanksgiving to you, too, June. I wish everyone could win. But if you can’t a paperback costs less than a grande latte — and there are no calories. Treat yourself. It looks like I am way behind on this series. I don’t seem to get very far at my bookstore, I will have to start at Z and work back sometime. Equal time for those of us at the end of the alphabet, Rachelle. We had to wait till last in school, too. Keep on writing, Elaine. I’ve enjoyed both series so much. I didn’t know about fake cakes. That’s still pretty expensive to me. maybe it’s a good thing I didn’t have a wedding. For my daughter’s reception a talented friend of my Elaine made what I thought was very nice just for fun. I just supplied cake mix and supplies. A singing telegram girl? Now that’s an interesting job. Congratulations on five years of marriage. Fake wedding cakes – who knew!!! Love your books.! I would love to win this for my daughter who loves cozy’s. Thank you for hosting this giveaway. Im looking forward to reading this series! I have them on my to be read list, this sounds like a very interesting cozy! I enjoyed reading your interview. the fake cakes are so cute! After recently finishing reading one of the books in the Dead End Job Series, I immediately added her to my short list of most favorite cozy writers. I want to read them all!!! Now that’s a list I want to be on, Carol. Love this series. Can’t wait to read this one. Love the book! The photos have me planning a stop in Forest Park — I wonder if there will be an increase in visitors and/or weddings because of _Murder Is a Piece of Cake_. 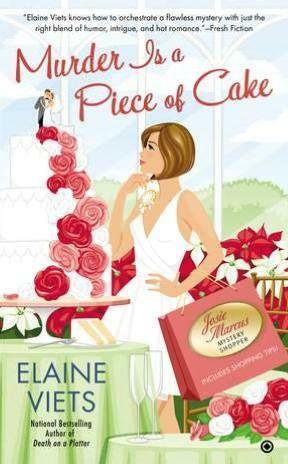 I’m really excited about “Murder Is a Piece of Cake,” Ilene. This is the most romantic Josie book yet, but there’s a good mystery, too. I hope so, Mary. 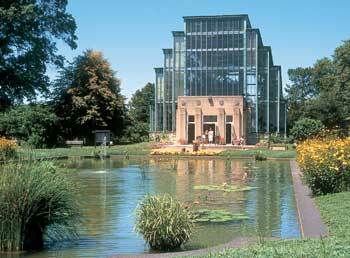 I spoke to a group of high school students in suburban St. Louis and was sad that they’d never heard of the Jewel Box or been to Tower Grove Park. My New York editor was so impressed by my hometown’s beauty. never even heard of these cozy type books.they sound like fun.thanks for the chance to win. This sounds like a lot of fun. I can’t wait to read it. Thank you for this giveaway, I love the title of this book. I have a few of your books and enjoy each one. Josie’s wedding is a special book for me, Angela. Hope you’ll like it, too. How have I missed this series? It sounds marvelous! I’ve been hooked on the series from the very first book. I’m excited to hear about Josie in her married life! I’m sure there will be plenty of entertainment. Josie is one of my favorite characters. I enjoy the interaction among the three generations. I’m unfamiliar with this series, but it sounds very interesting. I love a good mystery. Wow, I have got to read this series. This sounds great (and scrumptous too)! I guess I can read a book and eat the cake too. (Oh, so sorry. I just had to say it). No calories in reading, Kelly. I’m not familiar with this series but I’m looking to branch out from the mysteries I usually read…this series sounds interesting. Wow, I had no idea that people used fake cakes, so interesting! Your whole series sounds wonderful, I will be putting it on my wish list. Betty and Merry, I hope you will try this series — and let me know what you think of the books. You can email me at eviets@aol.com. I look forward to hearing from you. Thank you so much for sharing your stories with us! I love this series and have told so many by word of mouth and my Facebook and Pinterest! Thank you. Thank you, Lisa Kay. Word of mouth is the best way to sell books. I appreciate your recommendation. My daughter and I are both big fans of this series as well as the Dead End jobs one. We never knew that about renting a fake wedding cake…and she’s a pastry chef! Thanks for all the great books! Love the sounds of this series!! Will have to check out the Dead End jobs one! Thanks for such a fantastic giveaway! 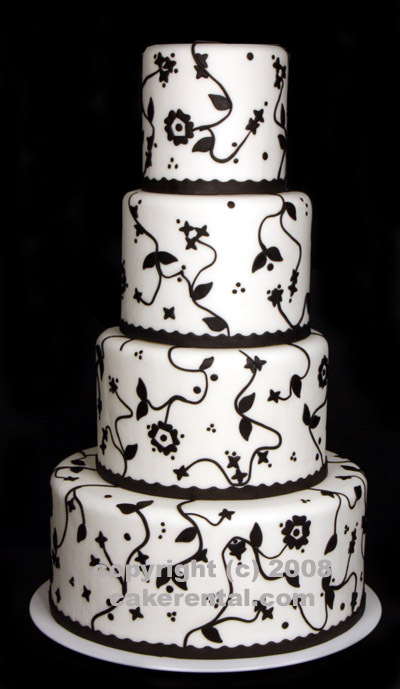 I love the black & white cake pictured above, and I think the idea of a fake cake is great. Weddings seem to cost more than a down payment for a house…so every little bit helps in cutting costs. This book sounds like a fun read. I will add to my TBR pile.